Size of Male: 40-50 lbs., 18-20 in. Size of Female: 30-40 lbs., 17-19 in. The Polish Lowland Sheepdog is usually known by his nickname, the PON (in Polish, Polski Owczarek Nizinny). PONs are very popular herding and working dogs in Poland and have been known since before the 16th century. Intelligent, spirited, fearless and affectionate, these dogs can adapt to different lifestyles. They are very loving toward their family and toward children. They make excellent family dogs. It’s believed by breed experts that the Polish Lowland Sheepdog is descended from the coated working dogs of Central Asia, the Puli dog, and the Huns herding dog. These crosses took place prior to the 16th century since by that time the PON seems to have existed in his present form. According to one story, around 1514 several PONs were traded to a shepherd in Scotland and these dogs became the ancestors of the Bearded Collie once they were bred with local dogs. The Bearded Collie bears a strong resemblance to the PON in looks and character. Through the centuries, the PONs has been used to work sheep and cattle. They have also been popular with people living in apartments in Poland. They have also been good guards for family homes. The breed almost became extinct following World War II but was saved by breeders. The Polish Lowland Sheepdog is considered to be intelligent, active and hardy. They are hard-working, obedient dogs and usually quite fearless. They will protect their family and home, despite their small/medium size. They are very loyal and devoted to their owners. They are usually good-tempered and get along well with other dogs and other pets. These dogs can bond very closely with their family and they love children. However, they will usually be aloof with strangers. PONs are very confident dogs and they do require socialization and dog training from a young age. They have strong herding instincts and they may try to herd people, especially children, or other pets. They may even nip heels. It’s best that they learn this behavior is not acceptable from a young age. If they feel that their owner is not in charge they will try to assume that role, so their owner needs to make sure they are confident in dealing with dogs. PONs are very adaptable and happy living in different situations. These dogs have a strong desire to please. They are clever and they are also independent thinkers. These dogs like having a job to do. They are capable of great things in obedience, agility and other dog activities. Living Environment – The Polish Lowland Sheepdog is very adaptable in terms of living situation. They are very popular as apartment dogs in Poland. As long as they get enough exercise they can make ideal apartment dogs. They also enjoy having their own yard. With their long, shaggy coat, they do enjoy cooler weather. Grooming – Grooming isn’t difficult but this breed does need to be brushed or combed every day to prevent matting. They have a double coat that is long, dense and shaggy. It is quite thick. They should look natural but clean. No clipping is required but you should trim around their paws to keep them from tracking mud. Diet & Exercise – According to one source, this dog breed requires a low protein diet. You should talk to your dog’s breeder about his dietary needs. The PON needs moderate daily exercise. Long walks should meet his needs. He will also enjoy having a small yard of his own. Health – Health wise this is considered a relatively healthy breed of dog. However, they can have problems with canine hip dysplasia and dog eye problems. You should talk to a breeder about possible dog health problems in the breed if you are interested in getting a PON. 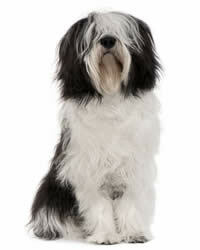 The Polish Lowland Sheepdog is quite an intelligent dog and they are credited with having an excellent memory. It is said that they want to please and that dog training is easy. However, they can be willful and they will take charge if they think that the owner is a pushover. It’s best if these dogs are thoroughly socialized and trained from a young age. They have strong herding instincts and may try to herd people or nip heels, so the sooner the puppy learns that these are not acceptable behaviors, the better. Use positive dog training methods (praise, reward) and you should have no trouble training you PON.